My Sea Bag Is Ready For Spring Break! I know so many of us are heading off to somewhere warm over the next few weeks. Time to pack the beach tote with sunscreen, shades and a good book and forget about what you have going on at work and school. I will be super stylin’ with my new Sea Bag. These cool bags and accessories are actually handmade from recycled sails in Portland Maine! I spending my hard-earned cash on product Made In The USA. This means each bag is totally unique; and if you are a fan of sailing and exploring you will simply love the idea that each bag has such experience and history. The Company collects sails straight from passionate boaters. Each is so rich in “story” and they are then crafted into products in their shop right on the water in Portland. What could be cooler than recycling sails, sewing them into these beautiful bags all the while with the scent of the sea air and the sound of the sea birds are all around them. I actually want to book a trip now and check out the place. I am in love! 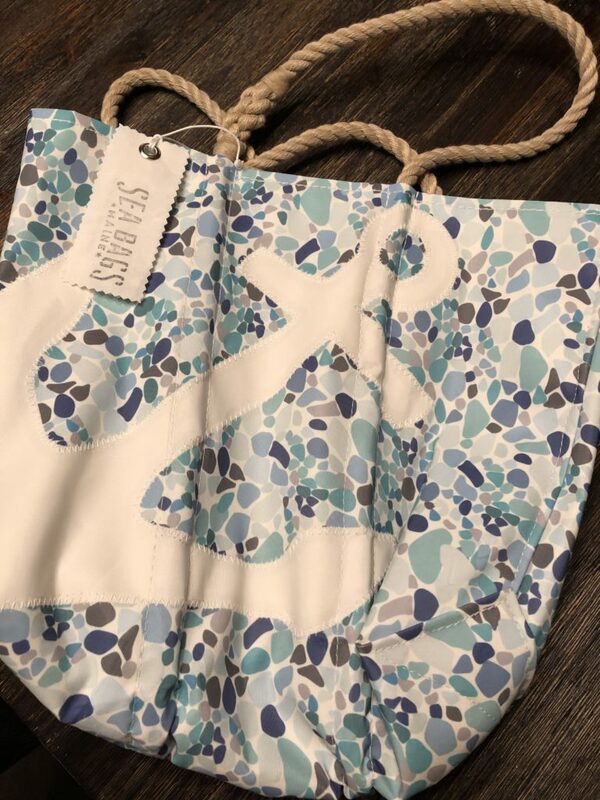 I am enjoying my White Anchor on Sea Glass Print Tote ($150) which is a beautiful print with sea glass coloring. There is intricate zig zag stitching and a printed anchor. The rope handles are super sturdy and the quality is perfect for packing your essentials for a great day with your toes in the sand. If need by, you can machine wash and line dry the bags which is great to know since if your kids are anything like mine you aren’t getting through a week of vacation without someone squirting sunscreen either on the inside or outside of your tote (LOL). They have so many styles to choose from and great size options (they offer a slightly larger tote, bucket bags, wristlets and cosmetic bags as well). In addition there are other simply gorgeous home decor items like table and desk items, doormats, wine bags, even pillows! Think Mother’s Day/Father’s Day/Summer hostess gifts even bridal showers! I can’t say enough about the detail and quality of their products. This is your something new and different! There are custom options as well! Please check them out!